It won’t be too long before I can tell the whole story and/or direct you to the bigger picture from which these images of the New River and surrounding farmlands in Grayson County have come. 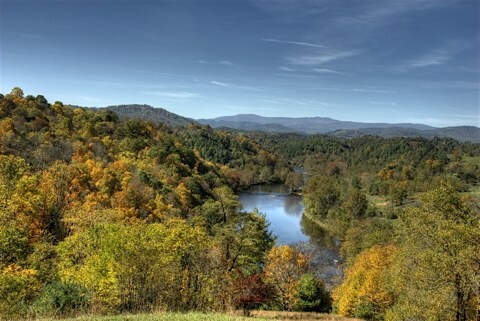 The New begins in North Carolina near Boone and flows north, cutting through the Appalachian ridges to join the Kanawha in West Virginia, and hence to the Mississippi and the Gulf near Nawlins. In the distance, Mt. Rogers, Whitetop and Pine Mt.–the three highest peaks in Virginia on a perfect October day. Life is good. Beautiful!! I remember when I first learned that New River flows north. I had been taught that all rivers in NA flow south. There is a mention of Floyd in the newest Smithsonian Magazine. Oh, wow! What a picture! Blog/computer and I were dueling. Amazing that a river that starts near Boone drains into the Mississippi. I thought Boone was on the eastern side of the Appalachian crest. It seems that rivers make up their own mind where to cut through the mountains. The Tennessee cuts through the Cumberland Plateau at Chattanooga, narrowing with a fast current partly mitigated by TVA management. Never figured out why the river gods decided that route. It doesn’t make sense to us mere mortals. Beautiful! This weekend is my ‘fall retreat’ to Floyd, and I can’t wait, especially after seeing images like this! Just to fill you in, there is absolutely no proof that the new river is indeed the second oldest river on earth. The fact came as propaganda for a campaign in the 70’s to save the river from being damned. They had good intentions but no legit source of knowledge. Look it up if you don’t believe me. Wow, love the photos and the feeling of tranquillity from the words and photos. We in SA has a saying, “hamba gatchle”… go well, (include peacefully easy if you like ;->). You are indeed privileged to be able to take beautiful photos of a beautiful corner of the world.